Only 3 left - order now! You'll receive 15% off all your replacement sediment filters, carbon filters, DI cartridges and membranes FOR LIFE. Just add any of these systems to your cart along with the Flood Guardian to unlock a discount in your shopping cart! We have assembled a high quality yet economical water purifying system that turns ordinary tap water into ultra-pure water for your aquarium or sparkling, great-tasting healthy drinking water for you and your family. Harmful impurities such as nitrates, phosphates, silicates, pesticides, heavy metals are removed though filtration and absorption; leaving behind KleanWater as nature intended! Note: A flush valve can significantly enhance the life of TFC membrane by flushing out any harmful impurity from the membrane. Marine Depot was started in 1998 by a self-professed reef geek and pre-med student Ken Wong. Ken envisioned a one-stop shop where customers could find everything they needed, from technical product specifications, reef aquarium information, expert advice on the hobby and friendly one-on-one customer support. 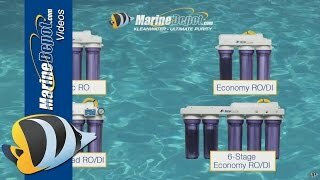 Having grown from a one-man crew to being one of the world’s largest suppliers of reef and marine aquarium products, this very core philosophy still lives strong in the Marine Depot culture 20 years later. Easy to set up... Makes 5 gal R/O in about 45 minutes. Seems to be constructed from quality materials. I'm pleased with the purchase. Economical entry level RO/DI Unit (especially with a 15% off flash sale). Easily expandable. Be sure to buy a pressure gauge - it will be the first add-on you'll elect to add on.